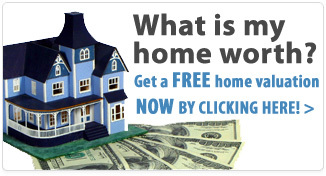 You can’t miss it! 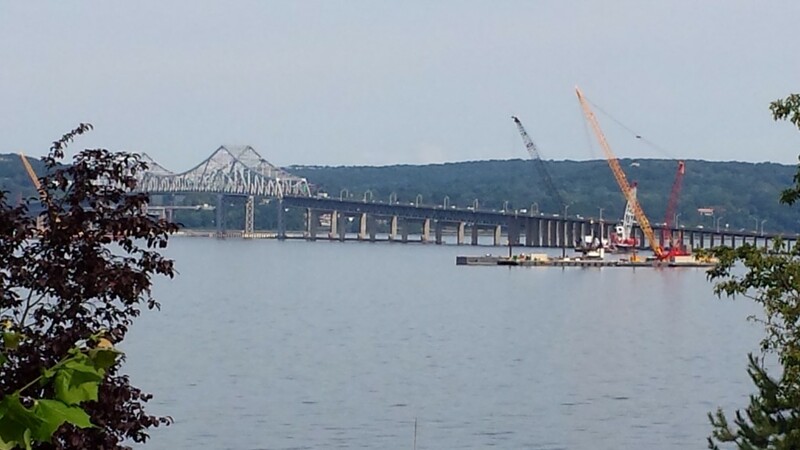 The new Tappan Zee Bridge construction has begun! The work barges carrying cranes are lined up on both sides of the bridge. Tugboats scurry between them shuttling workers from Petersen’s Boatyard in Upper Nyack. The barges have already caused daily “rubbernecking delays” in both directions on the bridge. In the near future, there will be 40-50 work barges on the river! This is a brief scenario of what will be taking place… On August 1, the EPA allowed the dredging of the river to begin. This will deepen the river’s shallow water levels in the work zones where the pile driving will take place. The new bridge will have twin spans for eastbound and westbound traffic. The northern span will be built first. This span will also have a bicycle/pedestrian lane on the north side complete with “belvederes” or sitting areas. After the northern span is completed (about 2-3 years) the present bridge will be closed to traffic and traffic will be diverted onto the northern span. 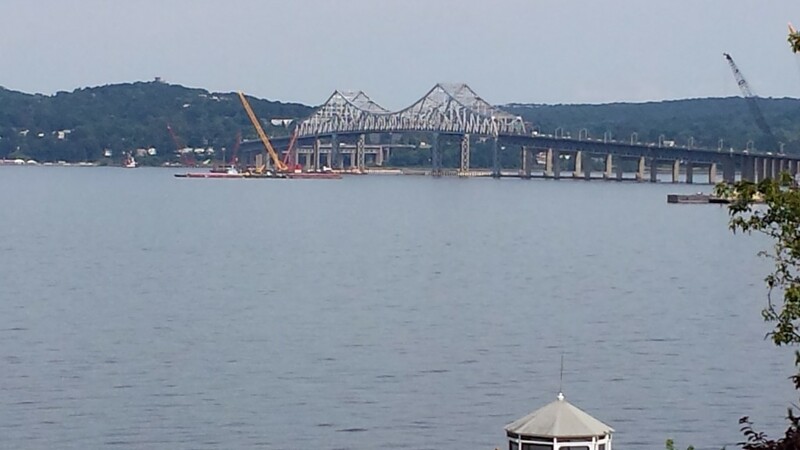 This span will be used for traffic in both directions while the present Tappan Zee Bridge is taken down and the southern span is built in its footprints. The entire project should be completed in five years. When the time comes for the present bridge to be dismantled, get ready for the Left Coast Lifter! This is the largest barge crane on the West Coast and is presently in San Francisco Harbor helping to rebuild the San Francisco-Oakland Bay Bridge. The Left Coast Lifter has a 328 foot boom and 1,800 short tons lift capacity. It will be “folding” itself, literally, to go through the Panama Canal to come to the Hudson River! It’s the Godzilla of lifters… stay tuned! 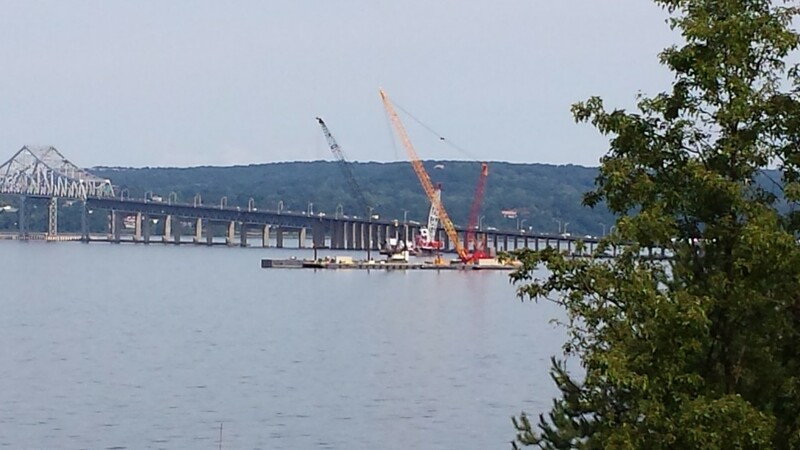 Follow my blog for Tappan Zee Bridge Construction periodic updates! Wow! that’s great information, keep up the good work Robin. Love this blog. I am no longer living in the area but this place will always be in my heart. I cannot wait to see a picture of the left coast lifter!